The pascal (symbol: Pa) is the SI derived unit of pressure used to quantify internal pressure, stress, Young's modulus and ultimate tensile strength. It is defined as one newton per square metre. It is named after the French polymath Blaise Pascal. Common multiple units of the pascal are the hectopascal (1 hPa = 100 Pa) which is equal to one millibar, and the kilopascal (1 kPa = 1000 Pa) which is equal to one centibar. The unit of measurement called standard atmosphere (atm) is defined as 101325 Pa. Meteorological reports in the United States typically state atmospheric pressure in millibars. In Canada these reports are given in kilopascals. The unit is named after Blaise Pascal, noted for his contributions to hydrodynamics and hydrostatics, and experiments with a barometer. The name pascal was adopted for the SI unit newton per square metre (N/m2) by the 14th General Conference on Weights and Measures in 1971.
where N is the newton, m is the metre, kg is the kilogram, s is the second, and J is the joule. The unit of measurement called an atmosphere or a standard atmosphere (atm) is 101325 Pa (101.325 kPa). This value is often used as a reference pressure and specified as such in some national and international standards, such as the International Organization for Standardization's ISO 2787 (pneumatic tools and compressors), ISO 2533 (aerospace) and ISO 5024 (petroleum). In contrast, International Union of Pure and Applied Chemistry (IUPAC) recommends the use of 100 kPa as a standard pressure when reporting the properties of substances. Unicode has dedicated code-points U+33A9 ㎩ SQUARE PA and U+33AA ㎪ SQUARE KPA in the CJK Compatibility block, but these exist only for backward-compatibility with some older ideographic character-sets and are therefore deprecated. 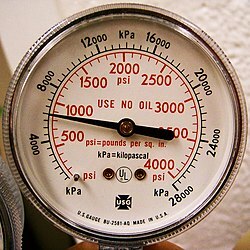 The pascal (Pa) or kilopascal (kPa) as a unit of pressure measurement is widely used throughout the world and has largely replaced the pounds per square inch (psi) unit, except in some countries that still use the imperial measurement system or the US customary system, including the United States. Geophysicists use the gigapascal (GPa) in measuring or calculating tectonic stresses and pressures within the Earth. Medical elastography measures tissue stiffness non-invasively with ultrasound or magnetic resonance imaging, and often displays the Young's modulus or shear modulus of tissue in kilopascals. In materials science and engineering, the pascal measures the stiffness, tensile strength and compressive strength of materials. In engineering use, because the pascal represents a very small quantity, the megapascal (MPa) is the preferred unit for these uses. The pascal is also equivalent to the SI unit of energy density, J/m3. This applies not only to the thermodynamics of pressurised gases, but also to the energy density of electric, magnetic, and gravitational fields. In measurements of sound pressure or loudness of sound, one pascal is equal to 94 decibels SPL. The quietest sound a human can hear, known as the threshold of hearing, is 0 dB SPL, or 20 µPa. The airtightness of buildings is measured at 50 Pa. The units of atmospheric pressure commonly used in meteorology were formerly the bar, which was close to the average air pressure on Earth, and the millibar. Since the introduction of SI units, meteorologists generally measure pressures in hectopascals (hPa) unit, equal to 100 pascals or 1 millibar. Exceptions include Canada, which use kilopascals (kPa). In many other fields of science, the SI is preferred, which means Pa with a prefix (in multiples of 1000) is preferred. Many countries also use the millibars. In practically all other fields, the kilopascal (1000 pascals) is used instead. ^ "Definition of the standard atmosphere". BIPM. Retrieved 16 February 2015. ^ "Resolution 4 of the 10th meeting of the CGPM". Conférence Générale des Poids et Mesures (CGPM). 1954. Retrieved 5 April 2010. ^ "CJK Compatibility" (PDF). 2015. Retrieved 21 February 2016. ^ "The Unicode Standard, Version 8.0.0". Mountain View, CA: The Unicode Consortium. 2015. ISBN 978-1-936213-10-8. Retrieved 21 February 2016. ^ "Tensile Modulus - Modulus of Elasticity or Young's Modulus - for some common Materials". Retrieved 16 February 2015. ^ "Chapter 7 ResNet Standards: ResNet National Standard for Home Energy Audits" (PDF). ResNet. 2010. Archived from the original (PDF) on 26 July 2011. Retrieved 3 March 2011. ^ "KNMI - Weer - Waarnemingen". Retrieved 4 December 2016. ^ "Comment convertir la pression? - IRM". Retrieved 4 December 2016. ^ "Japan Meteorological Agency - Weather Maps". Retrieved 4 December 2016. ^ United Kingdom, Met Office. "Key to symbols and terms". Retrieved 4 December 2016. ^ Canada, Environment. "Montréal, QC - 7 Day Forecast - Environment Canada". Retrieved 4 December 2016.